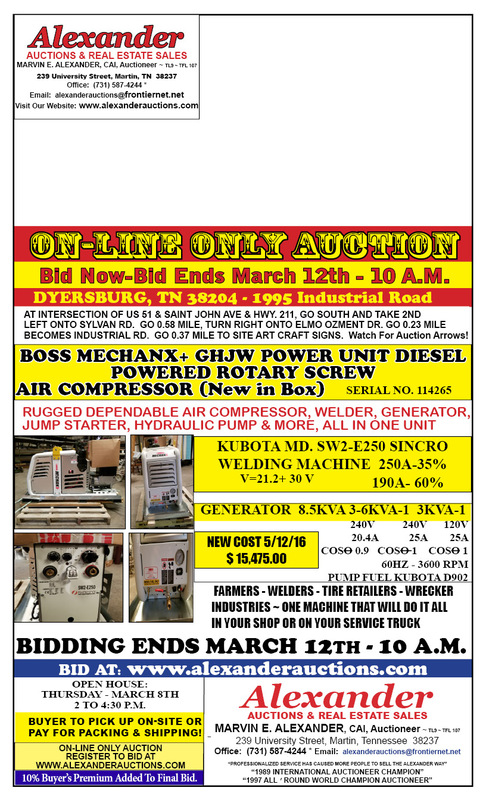 Bidding ends March 12th, 2018 at 10 a.m.
ENDING – MONDAY- MARCH 12TH, 2018 – 10 A.M.
4. CONDITIONS OF ITEMS SOLD: ALL INFORMATION IS BELIEVED TO BE ACCURATE, HOWEVER THE AUCTIONEER SHALL NOT BE RESPONSIBLE FOR THE CORRECT DESCRIPTION, AUTHENTICITY, GENUINENESS OF OR DEFECT IN ANY LOT, AND MAKES NO WARRANTY IN CONNECTION THEREWITH. NO ALLOWANCES WILL BE MADE OR SALE SET ASIDE ON ACCOUNT OF ANY INCORRECTNESS, ERROR IN CATALOGUING OR ANY IMPERFECTION NOT NOTED. NO DEDUCTION WILL BE ALLOWED ON DAMAGED ARTICLES AS ALL GOODS BEING EXPOSED FOR PUBLIC EXHIBITION ARE SOLD 'AS IS” AND WITHOUT RECOURSE. 5. 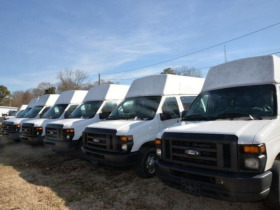 VANS ARE LOCATED AT THE ALEXANDER SUNSET AUCTION LOT, 1709 HWY. 431, MARTIN, TN 38237. 6. 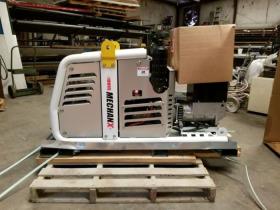 BOSS MECHANX+ GHJW POWER UNIT DIESEL POWERED ROTARY SCREW AIR COMPRESSOR IS LOCATED AND MUSTE BE PICKED UP AT 1995 INDUSTRIAL ROAD, DYERSBURG, TN 38204 BY APPOINTMENT . 7. ON-LINE & ABSENTEE BIDDING: A 10% BUYER’S PREMIUM WILL BE ADDED TO THE PURCHASE PRICE OF EACH ITEM TO REACH THE TOTAL SALES PRICE. 8. OFF-LINE ABSENTEE BIDDERS: PAYMENT FOR ALL VEHICLES, EQUIPMENT, AND TRAILERS REQUIRE CASH OR A WIRE TRANSFER – NO CREDIT CARDS ACCEPTED. 9. ON-LINE & ABSENTEE BIDDING: YOUR CREDIT CARD WILL BE CHARGED IMMEDIATELY FOLLOWING THE AUCTION FOR ITEMS WHICH CREDIT CARDS ARE ACCEPTED PAYMENT. 10. PAYMENT: ALL PURCHASES MUST BE PAID IN FULL ON AUCTION DAY. ALL BUYERS AGREE TO PAY FOR THEIR PURCHASES NO LATER THAN THE DAY OF THE AUCTION. ALL PAYMENTS ARE TO BE MADE IN U.S. CURRENCY BY CASH, CASHIER'S BANK CHECK, CERTIFIED BANK CHECK, OR PERSONAL CHECK WITH IRREVOCABLE LETTER OF CREDIT IN FAVOR OF ALEXANDER AUCTIONS & REAL ESTATE SALES, REQUIRED OF ALL PURCHASERS NOT PERSONALLY KNOWN BY THE AUCTION COMPANY. PURCHASERS WHO WISH TO PAY BY PERSONAL CHECK MUST BE CLEARED BY ALEXANDER AUCTIONS & REAL ESTATE SALES OR BY THE SELLER. ALL PROSPECTIVE BIDDERS ARE REQUIRED TO PRE-REGISTER FOR A BIDDING NUMBER AND GIVE EVIDENCE OF THEIR CREDIT-WORTHINESS. 11. ALEXANDER AUCTIONS & REAL ESTATE SALES DOES NOT TOLERATE ANY EXCUSES FOR A CHECK THAT DOES NOT CLEAR. PERSONAL CHECKS ARE ACCEPTED FROM PEOPLE WHO WE HAVE APPROVED AND WE EXPECT THESE CHECKS TO CLEAR THE BANK IMMEDIATELY. 12. TO BE AN APPROVED ON-LINE BIDDER AT THIS AUCTION YOU MUST HAVE A VALID VISA OR MASTERCARD CREDIT CARD ON FILE. YOUR CREDIT CARD ON FILE WILL BE CHARGED IMMEDIATELY FOLLOWING THE AUCTION FOR THE FULL AMOUNT OF THE WINNING HAMMER PRICE, PLUS PREMIUMS, PLUS SALES TAX ON ALL ITEMS SOLD SUBJECT TO CREDIT CARD PAYMENT. SHIPPING WILL BE CHARGED AFTER ITEM(S) ARE BOXED & READY TO SHIP. IF YOUR CREDIT CARD IS DENIED THERE WILL BE A $30.00 CHARGE. 13. ALL ITEMS PURCHASED OFF-SITE ARE TO BE PICKED UP AT THE AUCTION LOT. 14. BIDDER CONTRACT: THIS BIDDER CONTRACT ENTERED INTO BETWEEN THE BIDDER WHOSE NAME IS REGISTERED AND ALEXANDER AUCTIONS & REAL ESTATE SALES SHALL GOVERN THIS AUCTION AND HE/SHE AGREES WITH THE TERMS AND CONDITIONS. ADDITIONAL TERMS WHICH MAY BE POSTED OR ANNOUNCED FROM THE AUCTION BLOCK ARE JUST AS BINDING AS THE PRINTED TERMS AND CONDITIONS. 15. FULL PAYMENT: ALL ITEMS MUST BE PAID FOR IN FULL BEFORE BIDDER LEAVES THE PREMISES. NOTHING MAY BE REMOVED UNTIL IT IS SETTLED FOR. PAYMENT FOR PURCHASES MUST BE MADE BY CASH OR CASHIER’S CHECK OR BY PERSONAL CHECK OR BUSINESS CHECK. LETTERS OF CREDIT OR GUARANTEE MUST BE FOR THIS AUCTION ONLY, ALONG WITH PROOF OF IDENTITY. BIDDER AGREES NOT TO STOP PAYMENT ON CHECKS OR DISALLOW A BANK DRAFT AND IS RESPONSIBLE FOR ANY EXPENSES DUE TO COLLECTION OF BAD CHECK. 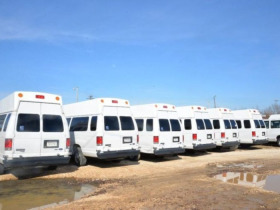 IN THE EVENT OF NON-PAYMENT OF BAD-CHECK, THE AUCTIONEERS RESERVE THE RIGHT TO REPOSSESS THE MERCHANDISE INVOLVED, AT ANY TIME, AT YOUR LOCATION. 16. COMPLIANCE WITH THE TERMS OF SALE – IN DEFAULT OF PAYMENT OF BILLS IN FULL WITHIN THE TIME ANNOUNCED FOR THIS AUCTION THE AUCTIONEER IN ADDITION TO ALL OTHER REMEDIES ALLOWED BY LAW, MAY RETAIN ALL MONIES RECEIVED AS DEPOSIT OR OTHERWISE, AS LIQUIDATED DAMAGES. LOTS NOT PAID FOR WITHIN THE TIME SPECIFIED HEREIN MAY BE RESOLD AT PUBLIC OR PRIVATE SALE WITHOUT FURTHER NOTICE. ANY RESULTING DEFICIENCY TOGETHER WITH ALL EXPENSES AND COSTS OF RE-SALE WILL BE THE RESPONSIBILITY OF THE DEFAULTING PURCHASER. EACH BUYER IN MAKING A BID DOES HEREWITH AGREE TO COMPLY WITH THE TERMS AND CONDITIONS AS HEREIN STATED AND AS OTHERWISE SET FORTH. THE FAILURE OR DEFAULT BY A SUCCESSFUL BUYER TO FULLY COMPLY WITH THE TERMS AND CONDITIONS HEREIN WILL BE TREATED AS AN IMMEDIATE BREACH AND THE DEPOSIT AS MADE RETAINED AND APPLIED TOWARD ANY DEFICIT IN ADDITIONAL COSTS OR CHARGES AS INCURRED TO EFFECT THE RESALE OF THAT PROPERTY AT PRIVATE OR PUBLIC SALE. THERE SHALL BE NO FURTHER NOTICE REQUIRED TO THE BUYER ONCE A DEFAULT HAS OCCURRED. THE OBLIGATION OF THE BUYER SHALL BE FOR COSTS AS INCURRED, PLUS ANY DEFICIT INCLUDED ARISING FROM THE BUYER’S DEFAULT. 17. 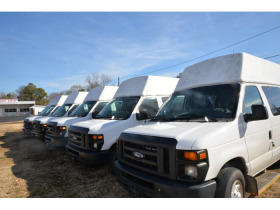 ALL ITEMS ARE AVAILABLE FOR VIEWING BEFORE THE ITEM IS OFFERED FOR AUCTION, AND YOU SHOULD MAKE AN INSPECTION OF THESE ITEMS BEFOREHAND SO THAT YOU ARE SATISFIED WITH THEIR CONDITION. 18. ALL PROSPECTIVE BIDDERS SHALL DETERMINE THE ACTUAL YEAR MODEL OF ALL VECHILES AND MOTORIZED VEHICLES. 19. BIDDERS WHO BID OFF-SITE AND ARE NOT PRESENT AT THE PREVIEW UNDERSTAND AND ACKNOWLEDGE THAT THEY MAY NOT BE ABLE TO INSPECT AN ITEM AS WELL AS IF THEY EXAMINED IT IN PERSON. IT IS THE BIDDER’S RESPONSIBILITY TO DETERMINE CONDITION, AGE, GENUINENESS, VALUE OR ANY OTHER DETERMINATIVE FACTOR. 20. ALEXANDER AUCTIONS & REAL ESTATE SALES IS PROVIDING INTERNET PRE-ACTION AND LIVE BIDDING AS A SERVICE TO BIDDER. BIDDER ACKNOWLEDGES AND UNDERSTANDS THAT THIS SERVICE MAY OR MAY NOT FUNCTION CORRECTLY THE DAY OF THE AUCTION. UNDER NO CIRCUMSTANCES SHALL BIDDER HAVE ANY KIND OF CLAIM AGAINST ALEXANDER AUCTIONS & REAL ESTATE SALES OR ANYONE ELSE IF THE INTERNET SERVICE FAILS TO WORK CORRECTLY BEFORE OR DURING THE LIVE AUCTION. ALEXANDER AUCTIONS & REAL ESTATE SALES WILL NOT BE RESPONSIBLE FOR ANY MISSED BIDS FROM ANY SOURCE. INTERNET BIDDERS WHO DESIRE TO MAKE CERTAIN THEIR BID IS ACKNOWLEDGED SHOULD LEAVE THEIR MAXIMUM BID 24 HOURS BEFORE THE AUCTION BEGINS. 21. DESCRIPTION TAKES PRECEDENCE OVER THE PICTURES. 22. ALL SALES ARE FINAL. ALL PURCHASERS ARE RESPONSIBLE FOR THE ITEM UPON THE FALL OF THE HAMMER. FALL OF THE HAMMER IN THIS ON-LINE AUCTION SHALL BE WHEN THE BIDDING ENDS AND THE FINDAL BIDDER BECOMES THE WINNER. ALEXANDER AUCTIONS & REAL ESTATE SALES WILL NOT ACCEPT ANY MERCHANDISE BACK BECAUSE YOU HAVE DECIDED THAT YOU DO NOT WANT IT OR YOU MAY DECIDE YOU HAVE OVERPAID FOR IT. IF YOU PURCHASE AN ITEM AND LEAVE AND DO NOT PAY FOR IT, THEN WE WILL PROCEED TO COLLECT FOR THE ITEM IN A LEGAL MANNER. 23. WARRANTY: ALL ITEMS ARE SOLD “AS IS”, “WHERE IS”, WITHOUT GUARANTEE OF ANY KIND. NO WARRANTY OF QUALITY, CONDITION, MERCHANTABILITY, OR FITNESS FOR INTENDED USE OR ANY PARTICULAR PURPOSE OR PARTICULAR USE IS GIVEN. ALL MERCHANDISE IS EITHER NEW, USED, CONSIGNED OR SALES ARE FINAL!! NO RETURNS OR CHARGE BACKS ALLOWED! RETURNS AND CHARGE BACKS WILL RESULT IN A BLACK FLAG WITH MARKNET. 24. THE DESCRIPTIONS OF ITEMS APPEARING IN ADVERTISING PRIOR TO THIS AUCTION ARE BELIEVED TO BE CORRECT. NEVERTHELESS, NEITHER THOSE DESCRIPTIONS NOR ANY ORAL STATEMENTS MADE BY THE OWNER (OR HIS AGENTS OR OFFICERS) OR THE AUCTIONEERS (OR HIS AGENTS OR OFFICERS) CONCERNING ANY ITEM SHALL BE CONSTRUED AS A WARRANTY, EITHER EXPRESSED OR IMPLIED, BIDDER AGREES TO INSPECT THE ITEMS THEY ARE BIDDING ON AND TO SATISFY THEMSELVES AS TO THE PROPER NAME, AGE, AND CONDITION OF THE ITEM. I, THE BIDDER, HAVE EXAMINED THIS MERCHANDISE AND ACCEPT IT IN, AS IS CONDITION. 25. ATTORNEY FEES: IN AN ACTION ARISING OUT OF THIS AGREEMENT, THE PREVAILING PARTY SHALL BE ENTITLED TO REASONABLE ATTORNEY FEES AND COSTS. 26. ANY COURT LITIGATION SHALL BE IN WEAKLEY COUNTY, TN. 27. ALEXANDER AUCTIONS & REAL ESTATE SALES WILL NOT TOLERATE ANY PILFERING OR TAKING OF ANY ITEM OR THEFT OF ANY ITEM. ANY WRONGDOING WILL BE PROSECUTED TO THE FULLEST OF THE LAW. 28. CONFIRMATION OF PURCHASE: TITLE TO THE PROPERTY SHALL PASS TO THE BUYER UPON THE FALL OF THE AUCTIONEER'S HAMMER, SUBJECT TO THE COMPLIANCE BY THE BUYER OF THE CONDITIONS OF SALE. BUYER ASSUMES ALL RESPONSIBILITY FOR THE ITEM OR ITEMS AND SHALL PAY THE TOTAL PURCHASE PRICE. 29. UCC SECTION 2-328 (4) DISCLAIMER: SECTION 2-328(4) OF THE UCC STATES, “IF THE AUCTIONEER KNOWINGLY RECEIVES A BID ON THE SELLER’S BEHALF OR THE SELLER MAKES OR PROCURES SUCH A BID, AND NOTICE HAS NOT BEEN GIVEN THAT LIBERTY FOR SUCH BIDDING IS RESERVED, THE BUYER MAY AT HIS OPTION AVOID THE SALE OR TAKE THE GOODS AT THE PRICE OF THE LAST GOOD FAITH BID PRIOR TO THE COMPLETION OF THE SALE.” ACCORDINGLY, THE SELLER AND THEIR AGENTS, HEREBY, RESERVE THE RIGHT TO BID AT TODAY’S AUCTION. 30. RESERVE: ALL ITEMS ARE SOLD WITH RESERVE UNLESS STATED OTHERWISE. IF RESERVE ITEM DOES NOT MEET SET PRICE ITEM MAY BE PASSED OR SELLER MAY CONFIRM PRICE. 31. 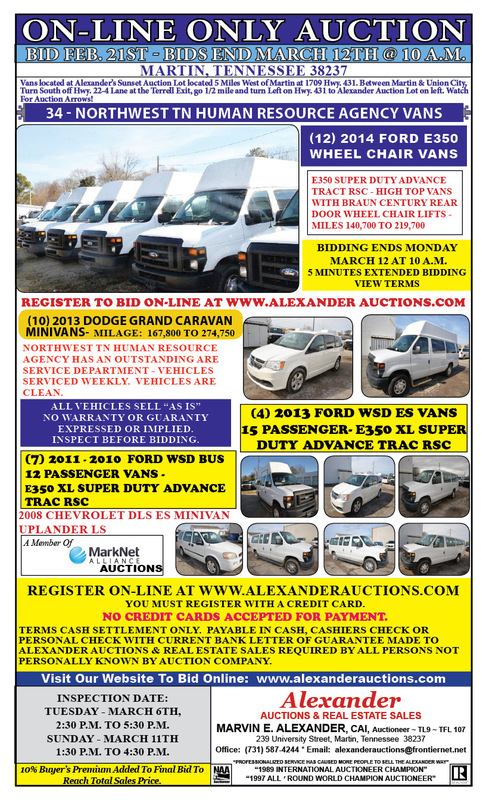 ALEXANDER AUCTIONS IS PROVIDING INTERNET PRE-AUCTION AND LIVE BIDDING AS A SERVICE TO BIDDER. BIDDER ACKNOWLEDGES AND UNDERSTANDS THAT THIS SERVICE MAY OR MAY NOT FUNCTION CORRECTLY THE DAY OF AUCTION. UNDER NO CIRCUMSTANCES SHALL BIDDER HAVE ANY KIND OF CLAIM AGAINST ALEXANDER AUCTIONS AND REAL ESTATE SALES OR ANYONE ELSE IF THE INTERNET SERVICE FAILS TO WORK CORRECTLY BEFORE OR DURING THE LIVE AUCTION. 32. INTERNET BIDDERS WHO DESIRE TO MAKE CERTAIN THEIR BID IS ACKNOWLEDGED THEIR BID IS ACKNOWLEDGED SHOULD USE THE PROXY-BIDDING FEATURE AND LEAVE THEIR MAXIMUM BID 24 HOURS BEFORE THE AUCTION BEGINS. 34. REMOVAL OF PROPERTY OR STORAGE: NONE OF THE PROPERTY MAY BE REMOVED FROM THE PREMISES UNTIL THE TOTAL PURCHASE PRICE HAS BEEN PAID. ANY ITEMS LEFT AND NOT REMOVED FROM THE PREMISES REMAIN AT THE SOLE RISK OF THE BUYER. REMOVAL SHALL BE AT THE EXPENSE, LIABILITY, AND RISK OF THE PURCHASER. PURCHASES CAN BE REMOVED ONLY ON PRESENTATION OF ORIGINAL BILL OF SALE. PHOTOSTATS OF BILLS OF SALE WILL NOT BE ACCEPTED FOR REMOVAL. UPON FAILURE OF PURCHASER TO REMOVE GOODS WITHIN TIME SPECIFIED AS POSTED OR ANNOUNCED, AUCTIONEER SHALL HAVE THE OPTION OF REMOVING AND STORING THE GOODS AT EXPENSE AND RISK OF THE PURCHASER OR DEEMING MONEY DEPOSIT FORFEITED IN WHICH CASE AUCTIONEER MAY RESELL WITHOUT NOTICE AT PUBLIC SALE OR OTHERWISE DISPOSE OF GOODS AT RISK AND EXPENSE OF PURCHASER. PURCHASER SHALL REMAIN LIABLE FOR LOSS, EXPENSE AND DAMAGES ARISING FROM THE PURCHASER’S DEFAULT. 35. SALES TAX: SALES TAX WILL NOT BE COLLECTED ON VEHICLES. 36. SALES TAX OF 9.75% WILL BE COLLECTED ON ALL TAXABLE ITEMS. 37. NO VEHICLE CAN BE REMOVED THE DAY OF THE AUCTION – MARCH 12TH, 2018. 38. VEHICLES CAN BE REMOVED AFTER CASH SETTLEMENT ON TUESDAY, MARCH 13TH, 2018. 39. PURCHASERS NAME SHALL BE INCLUDED ON THE TITLE EXCEPT FOR DEALERS. NO OPEN TITLES WILL BE GIVEN OUT AND NO NAMES WILL BE SWITCHED AFTER THE SALE. 40. REMOVAL OF ALL ITEMS: VECHILES MUST BE REMOVED ON OR BEFORE MARCH 26TH, 2018 AT 4:30 P.M. REMOVAL MAY BE ARRANGED BY APPOINTMENT ONLY TO REMOVE AFTER MARCH 13TH, 2018. 41. ALL ITEMS INCLUDING SALVAGE ITEMS MUST BE REMOVED ON OR BEFORE MONDAY, MARCH 26TH, 2018 BY 4:00 P.M.
42. LOADING ON ANY DAY AFTER AUCTION MUST BE BY APPOINTMENT ONLY. CALL ALEXANDER AUCTIONS & REAL ESTATE SALES AT (731) 587-4244 OR (731) 225-7368. 43. ALEXANDER AUCTIONS & REAL ESTATE SALES AND THE SELLER DO NOT AND WILL NOT BE RESPONSIBLE FOR OR FURNISH ANY SECURITY FOR ITEMS AFTER THE FALL OF THE HAMMER. 44. INSURE ITEMS WHEN YOU PURCHASE THEM. 45. 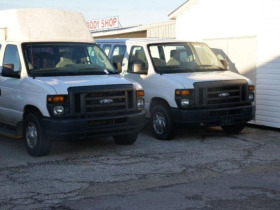 PURCHASER SHALL BE RESPONSIBLE FOR ALL LOADING AND REMOVING THEIR VEHICLES AND TRUCKING. 46. BIDS: ALEXANDER AUCTIONS & REAL ESTATE SALES RESERVES THE RIGHT AND DOES ACCEPT ABSENTEE BIDS FROM INDIVIDUALS AND WILL ATTEMPT TO EXECUTE THESE BIDS. ITEMS WILL BE SOLD TO SAID INDIVIDUALS PROVIDED THEY ARE THE HIGH BIDDER. IF ANYONE WOULD LIKE TO LEAVE AN ABSENTEE BID ON ANY ITEM, GO BY THE CASHIER'S DESK, SIGN A FORM, AND LEAVE PAYMENT. YOUR BID WILL BE EXECUTED. IN THE EVENT YOU ARE NOT THE SUCCESSFUL BIDDER, YOUR MONEY WILL BE REFUNDED. 47. DISPUTE BETWEEN BIDDERS: IF ANY DISPUTE ARISES BETWEEN TWO OR MORE BIDDERS, THE AUCTIONEER MAY DECIDE THE SAME OR MAY IMMEDIATELY PUT THE LOT OR ITEM UP FOR SALE AGAIN, AND RE-SELL TO THE HIGHEST BIDDER. THE DECISION OF THE AUCTIONEER SHALL BE FINAL AND ABSOLUTE. 48. ADDITION TO OR WITHDRAWAL FROM SALE: THE AUCTIONEER RESERVES THE RIGHT TO WITHDRAW FROM SALE ANY OF THE ITEMS; TO SELL AT THIS AUCTION ITEMS NOT LISTED; TO GROUP ONE OR MORE LOTS INTO ONE OR MORE SELLING LOTS OR TO SUBDIVIDE INTO TWO OR MORE SELLING LOTS. THE AUCTIONEER ALSO RESERVES THE RIGHT TO SELL ALL OF THE ITEMS LISTED IN BULK. 49. AUCTIONEER: THE AUCTIONEER, WHEN ACTING, AS AGENT IS NOT RESPONSIBLE FOR ACT OF ITS PRINCIPALS. 50. OWNERSHIP: ALL ITEMS BECOME THE SOLE RESPONSIBILITY OF THE PURCHASER IMMEDIATELY AT KNOCKDOWN. NO REFUNDS OR ADJUSTMENTS WILL BE ALLOWED FOR ANY SHORTAGES. IF YOU BELIEVE YOU ARE ENTITLED TO AN ADJUSTMENT TO YOUR INVOICE DUE TO MISSING OR DAMAGES ITEM(S), YOU, YOUR MOVER OR YOUR RIGGER MUST REPORT THE PROBLEM TO OUR ON-SITE SUPERVISOR PRIOR TO SETTLEMENT AND THE ITEMS LEAVING THE PROPERTY. ONCE THE ITEM HAS LEFT THE PROPERTY, THERE WILL BE NO ADJUSTMENTS. WHEN YOU HIRE A MOVER/RIGGER, THE MOVER/RIGGER IS ACTING AS YOUR AGENT. 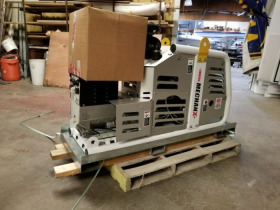 WE WILL NOT ACCEPT THAT THE MOVER/RIGGER DID NOT NOTIFY YOU OF A MISSING OR DAMAGED ITEM(S) OR THAT IT WAS DISCOVERED THAT AN ITEM(S) WAS MISSING OR DAMAGED WHEN YOUR PURCHASES WERE DELIVERED TO YOUR FACILITY. ALL BIDDERS AND MOVERS/RIGGERS MUST BE AWARE OF THIS POLICY! IF FOR ANY REASON WHATSOEVER A PROPERTY AS BID CANNOT BE DELIVERED WITHIN THAT PERIOD OF TIME OF DELIVER PROVIDED FOR AT THE SALE FOR ANY REASON WHATSOEVER, THE BUYER EXPRESSLY WAIVES LIABILITY ON THE PART OF ALEXANDER AUCTIONS & REAL ESTATE SALES, THE AUCTIONEER AND FURTHER AGREES THAT ANY OBLIGATION WITH RESPECT THERETO SHALL BE LIMITED TO THE BID AND PAID FOR SAID PROPERTY (ASSETS). 51.  ABANDONMENT: PURCHASERS WILL NOT BE ALLOWED TO ABANDON ANY PURCHASES OR PORTION OF THOSE PURCHASES. 52. NON-DELIVERY RESPONSIBILITY: AUCTIONEER SHALL NOT, IN ANY EVENT, BE LIABLE FOR NON-REMOVAL OR FOR ANY OTHER MATTER TO ANY PURCHASER OF ANY LOT. 53. PERSONAL AND PROPERTY RISK: PERSONS ATTENDING DURING EXHIBITION, SALE OR REMOVAL OF GOODS ASSUME ALL RISKS OF DAMAGE OF OR LOSS TO PERSON AND PROPERTY AND SPECIFICALLY RELEASE AND INDEMNIFY ALEXANDER AUCTIONS & REAL ESTATE SALES, THE AUCTIONEER FROM LIABILITY THEREFORE. NEITHER ALEXANDER AUCTIONS & REAL ESTATE SALES, THE AUCTIONEER NOR HIS PRINCIPAL OR SELLER SHALL BE LIABLE BY REASON OF ANY DEFECT IN OR CONDITION OF THE PREMISES IN WHICH THE SALE IS HELD. 54. RECORDS: THE RECORD OF SALE KEPT BY ALEXANDER AUCTIONS & REAL ESTATE SALES, THE AUCTIONEER AND BOOKKEEPER WILL BE TAKEN AS FINAL IN THE EVENT OF ANY DISPUTE. 55. NOMINAL BIDS: ANY BID WHICH IS MERELY A NOMINAL OR FRACTIONAL ADVANCE MAY BE REJECTED BY THE AUCTIONEER, IF IN HIS JUDGMENT IT MAY AFFECT THE SALE NEGATIVELY. 56. THE BUYER: DOES HEREBY ASSUME AND DOES AGREE TO INDEMNIFY AND HOLD ALEXANDER AUCTIONS & REAL ESTATE SALES, THE AUCTIONEER AND SELLER HARMLESS FROM ANY FUTURE CLAIM WHICH SHALL PERTAIN TO THE FITNESS OR US OF THAT ASSET AS BEING PURCHASED. 57. ADDITIONAL TERMS AND CONDITIONS: ADDITIONAL TERMS OR CONDITIONS OF SALE MAY BE ADDED BY AUCTIONEER BY ANNOUNCEMENT OR POSTED ON THE PREMISES PRIOR TO THE AUCTION. 58. CONDUCT OF AUCTION: ALEXANDER AUCTIONS & REAL ESTATE SALES, THE AUCTIONEER RESERVES THE RIGHT, WITHOUT GIVING ANY REASON, TO PUT UP ITEMS OUT OF NUMERICAL SEQUENCE AND TO WITHDRAW ANY ITEM, ITEMS, OR LOT FROM THE AUCTION. 59. ANY INDIVIDUAL AT THE AUCTION HAS THE RIGHT TO BID, INCLUDING ANYONE ATTENDING THIS AUCTION, OWNERS, AUCTIONEERS OR PERSONNEL WORKING IN THIS AUCTION. 60. ALL ANNOUNCEMENTS MADE FROM THE AUCTION STAND WILL TAKE PRECEDENCE OVER ANY PREVIOUS ANNOUNCEMENTS OR STATEMENTS. 61. PURCHASER SHALL BE RESPONSIBLE FOR THE LOADING AND MOVING OF THEIR ITEMS. ALEXANDER AUCTIONS & REAL ESTATE SALES DOES NOT FURNISH HELP TO LOAD OR MOVE ITEMS. 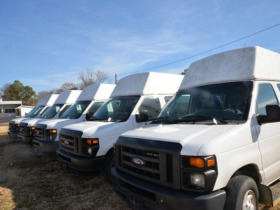 IN THE EVENT AN EMPLOYEE OF ALEXANDER AUCTIONS & REAL ESTATE SALES ASSISTS IN THE MOVING OR LOADING OF AN ITEM, ALEXANDER AUCTIONS & REAL ESTATE SALES SHALL NOT BE RESPONSIBLE FOR ANY DAMAGE OR ACCIDENT THAT MAY OCCUR TO THE ITEM OR PERSON THEY ARE ASSISTING. 62. ALL VEHICLES, EQUIPMENT, TRACTORS, BOATS, ATV’S AND OTHER ITEMS ARE SOLD “AS IS” WITHOUT A WARRANTY OR GUARANTEE MADE, EXPRESSED OR IMPLIED AS TO THE CONDITION OR FITNESS FOR USE. 63. THE INVENTORY SHEET PROVIDES INFORMATION ABOUT THE TITLES TO VEHICLES. 64. ALL TITLES ARE AVAILABLE TODAY UPON PAYMENT.